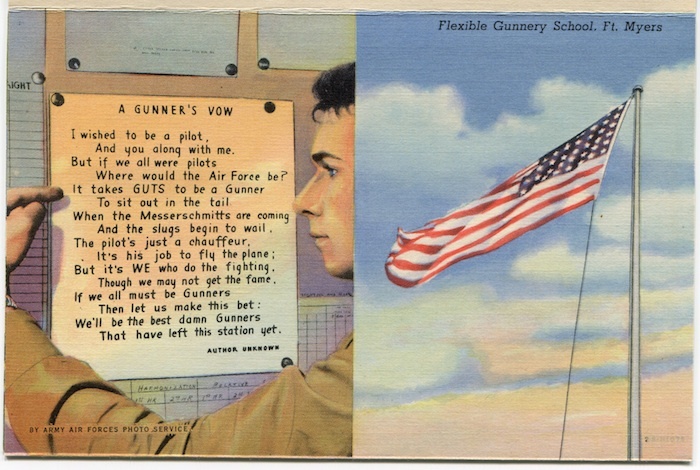 Dad carried a postcard set that contained “The Gunner’s Vow” all through the war. As the survivor of 59 missions as a WWII tail gunner, he always made a habit of sitting with his back to a wall, facing the door. One of the most amazing things about this project has been getting to know and understand more about active service. 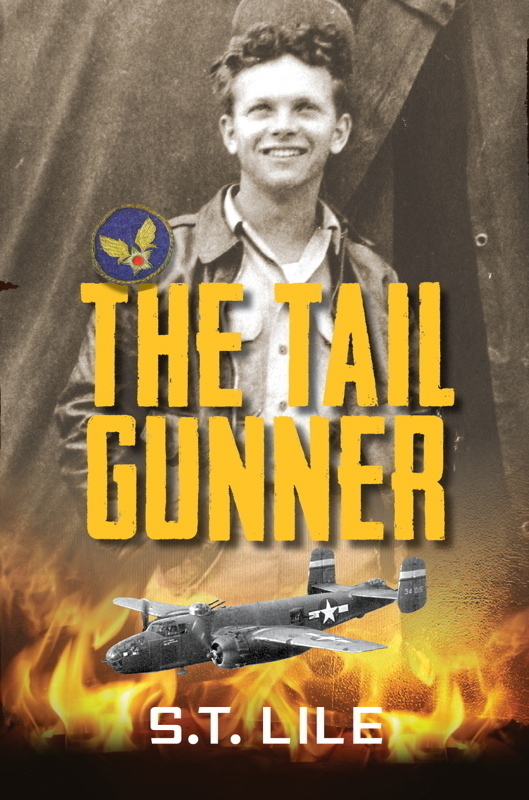 Writing THE TAIL GUNNER has led me into a world that Dad barely talked about for many reasons. It was a painful time and he was a “forward thinking” man, always more interested in embracing the future than reminiscing about the past. For those reasons, as well as the fact that I was born in the 1960s when war was way out of fashion, I never wanted to study much about wars or the men who fought in them. Dad didn’t mind a bit. But what has been intriguing is the mystery of all that he left behind, and the people it has led me to. At one point, I had the good fortune to do a phone interview with Norm Doe (since passed), one of the pilots Dad thought highly of. Norm filled me in on so many mysteries like why it took so long to get across the Atlantic when they shipped out (U-Boat dodging), and how Dad and Doe hadn’t flown together outside of training but once. In another instance, I found a list of names at the back of Dad’s diary that I figured must have been good friends. As I found out later, they were men in his squadron that had been killed in action. Although I couldn’t use their real names in the novel, their story was memorialized by the characters StuBoy and Valentine. Getting shot down in enemy territory was every bomber-boy’s nightmare. Despite the difficulties the characters face in THE TAIL GUNNER, it is also a story of hope, and a story about how the dead have the opportunity to choose how to end their stories. As StuBoy explains to Sylvie in the novel, these men get a choice: Take a swig of Lethe Lightning and forget all the horrors and highlights of life and war, or attempt a final mission to set right whatever life-bound wrongs may haunt them. Bish chose a final mission, and his mission makes the book. We all have our missions in life. We may not know them, but they are there, waiting for us to step foot on the waiting path. If someone had told me when I was in my 20s that I’d one day write a novel about World War II, I would have told them there was no way. But for the last seven years that has been my path. So to all veterans living and passed, I say “Thanks” for your courage, your dedication, and for your stories, both silent and loud. How we stand up for what we believe in makes us who we are. A newspaper clipping from the KBL Family Collection, special for this last day of our mission. 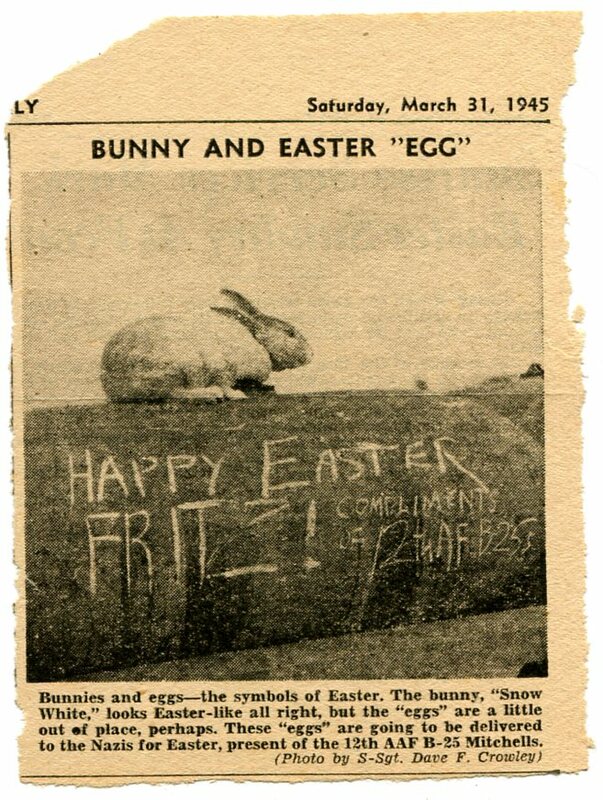 March 31, 2014 — We’ll end Mission 31 with one last blast from the past, a newspaper clipping the tail gunner saved from this day 69 years ago, Easter Sunday 1945. The war ended a month a half later for the 12th Army Air Force, leaving the tail gunner just one mission short of a full tour. This campaign is essentially the tail gunner’s last mission, the effort to make his and his buddy’s efforts known and remembered. That’s why this blog and fund-raising campaign go way beyond me, a daughter and writer, to all of you and the rest of the world. Each person who has joined the crew to make a contribution to the effort, has helped preserve an important and little-known effort in history. It is with the utmost respect and gratitude that I honor all those who were brave enough to step on board and trust our team to see the project through. If there were two things I inherited from my 59-mission surviving Dad it was tenacity and determination. Like Dad’s diary entries, his praise was often sparse, but one morning after I’d been up typing most of the night on one of my first magazine articles, he walked through his den, stopped and said, “Steph, I’m proud of you. You took an idea and made it happen.” Those words have stayed with me throughout my life, and every day I try to live up to them. Now I’m aiming to hit our target by 100%, just like Dad’s crew did on their last mission in March, 1945. 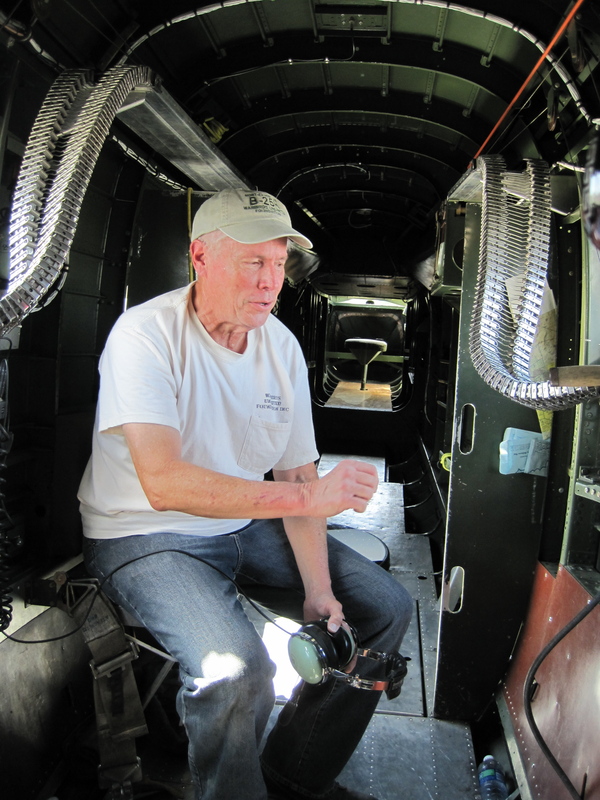 We’re on course to complete the real tail gunner’s 60th mission. Thanks to the many folks who have shown their support for the project, the book will be out this summer 2014. Just 4 days left to join The Tail Gunner crew! Gear up and jump on board. March 29, 2014 — With just four days left in the Tail Gunner campaign, we’re 76% of the way to our goal—that means we have just over $800 to raise before April 1st. As a fixed funding campaign, it’s an all-or-nothing deal, just as the men of the 445th squadron faced every time they were sent on a mission. March 29: Standown today again. I went down to the 310th I saw Marcus, Joe Pizarro, and his Engineer – All the Boys are doing alright. Saw Rankin, (from cadets) he’s doing O.K. Says Armorers are making Tech Sgt down there. Went to a show tonight – Bring on the Girls. Patton is soon going into Russia, and how. No mail. 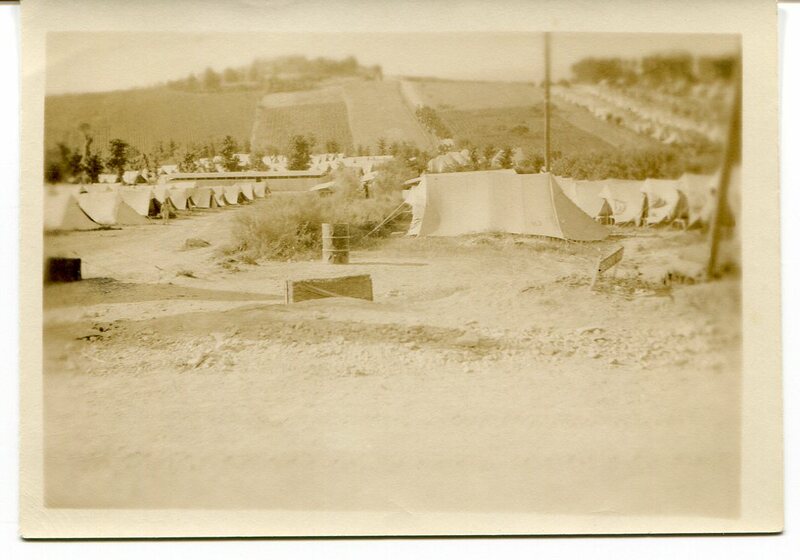 From those days on stand down came the great days when targets were hit at 100%. We’re aiming for that, and with your help, we can make it. So if you haven’t yet joined the crew and made a contribution to the production of the book and the preservation of the Tail Gunner collection, there is still time to gear up and get on board. Join THE TAIL GUNNER crew! There’s a few days left to help fund production of the novel and save the WWII collection that inspired it. Just 6 days left to join The Tail Gunner crew! Order your copy today. March 27, 2014 — In digging through Dad’s stash of WWII images and ephemera, I came across this little newspaper clipping, no doubt sent to him in one of his letters from home. While there is no date on the clipping, based on the info it reports, it has to date to around March 1945. 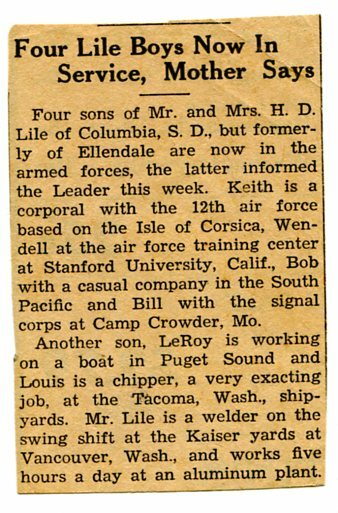 The clipping states that Dad (Keith) was on Corsica, and by April, Dad and his squadron had pulled up stakes and moved from Corsica to the base at Ancona, Italy. March 27: Standown on mission again today. Lowry & I are flying with Doe. Missions were Plan A and Plan B – we were on both of them. I got sick tonight – plenty sick – brother – and how. I think I will lay off taking these adaprin tablets. I heard from Mrs. Houbler – Betty – Morgan and the little book from the church. Too sick to answer anything. Although I’ve never found any of the letters Dad wrote to others during the war, I did realize why his diary entries were so sparse; he wrote all of his big news in his letters home. In THE TAIL GUNNER novel, I was able to use some of the letters he received in part, but the letters from him to others had to be pieced together from the clues he left behind. What has appeared in this blog series is but a smattering of the complete collection. Join THE TAIL GUNNER crew! Just 5 days left to help fund production of the novel and save the WWII collection that inspired it. Research takes us to many amazing places. This was one of them. The Barbie III based in Mesa, Arizona. Stephanie Lile photo. March 26, 2014 — Research for any story comes in many forms. 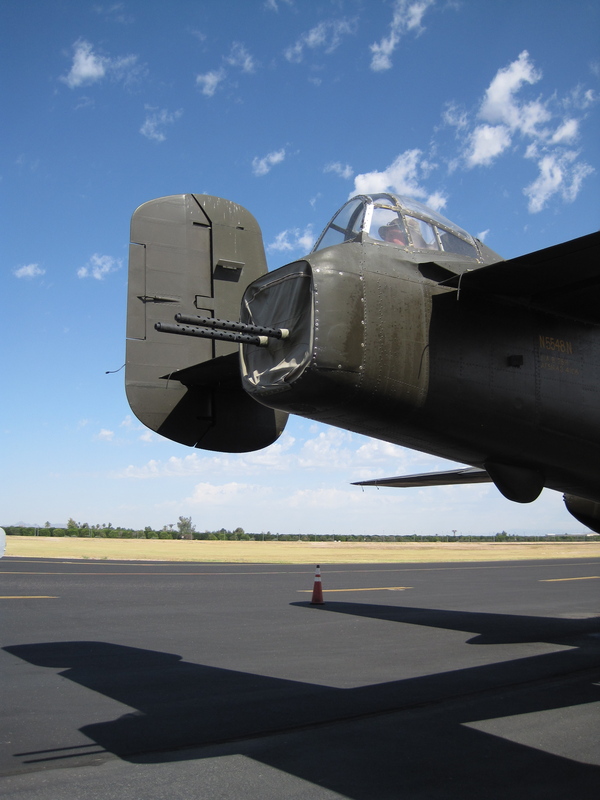 For The Tail Gunner, I knew I’d have to fly in a B-25. How could I write credible scenes otherwise? I needed to transport myself back to the 1940s, into the midst of World War II, and into the heart and mind of a bombing crew. 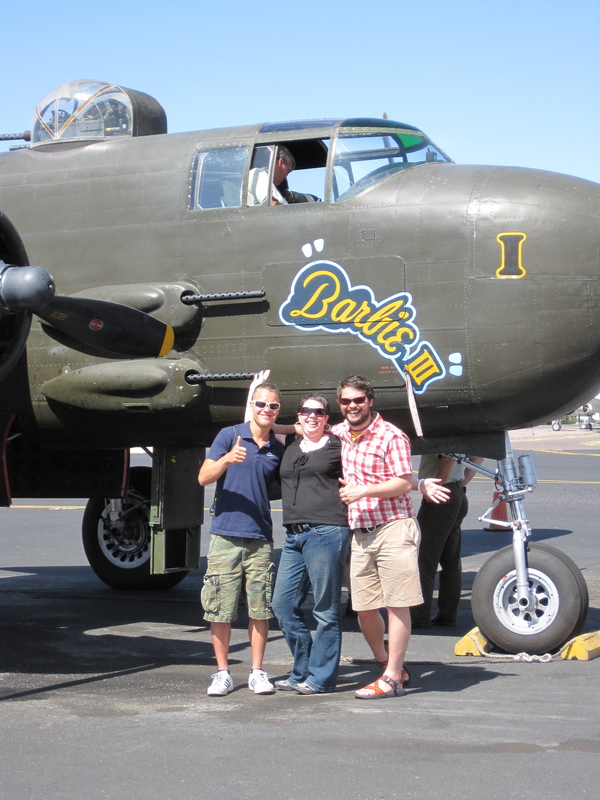 So, I decided to transport myself physically through time and space by going for a ride in a B-25. The Barbie III’s crew chief Bill. If you look just beyond him, you can see down into the tail to the stool where the tail gunner sat. Stephanie Lile photo. The environment (it’s a “working” but authentic restoration of the original right down to the seat belts), the noise (it’s a total mind-buzz requiring the use of serious ear muffs), the altitude (about 3,000-5,000 feet—although the real bomber boys flew as high as 10,000-12,000 feet), the motion (enough skittering side-to-side and up-and-down to lose your breakfast), the smell (a little diesel, a little metal, a lot of human sweat, a little puke), and finally the vastness of the view (about 300 degrees in the tail gunner position). Inside the back of the Barbie III, Dylan contemplates the waist gun. At about 19, he was the same age as Dad was when he started flying. Stephanie Lile photo. These planes are pretty amazing, and the men who fly them even more so. Only a couple steps up from a tuna can, the plane’s metal skin and long cables that run from front to back to work the tail made me wonder how anyone survived at all. At one point in my research I found a declassified document that stated that the production rate of B25s in about 1943 was based on an average estimated plane life of 11 missions. No wonder there was a whole lotta hoopla when a plane made 100 missions. 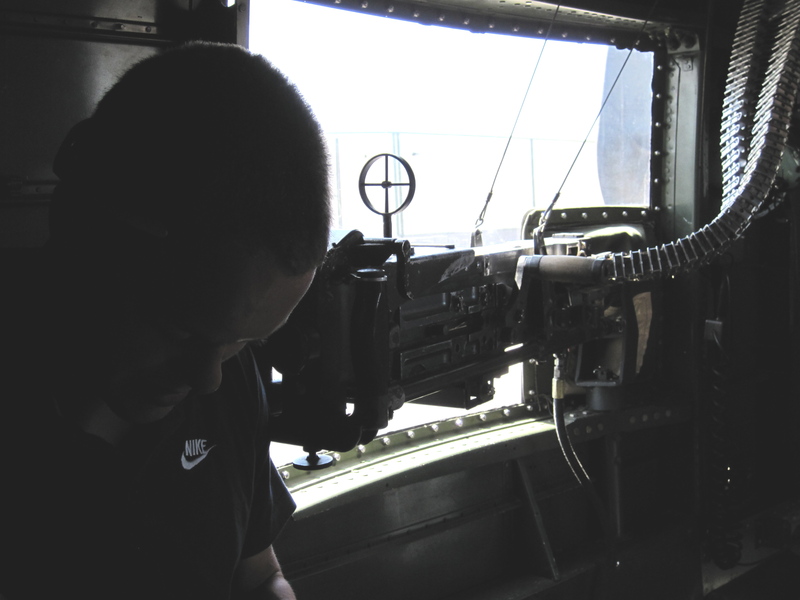 In flight, we took turns crawling out to the tail gunner position. My niece Haley and nephews Krister and Dylan had come along on the adventure so that they could get a piece of their grandpa’s adventure. When I took my turn in the tail gunner spot as we roared over the hills of Arizona, I breathed deeply and tried to tap into what my dad would have thought being out there in the tail for 59 missions over the mountains and valleys of Italy. Despite the great view, the tail blister was a hugely vulnerable position. I realized then that if every great story is built of character emotion, then this story would be a whirlpool of pride, determination, resignation, and being scared shitless a huge percentage of the time. My motley crew, 2009: Left to Right, Dylan Hall, Haley Lile, Krister Lile. Stephanie Lile photo. Our flight was “only” 30 minutes, but all of us agreed that it was truly the longest 30 minutes of our lives. By the end, both Dylan and I were carrying bags of barf (no more scrambled eggs for me or a while), and all of us were exhausted. Just that little taste gave us a feel for what those bomber crews must have felt like (times about 1000) as they set out on every mission not knowing if they would live or die. No matter what my writer friends say, I wouldn’t pass up this experience as a means to tap into the emotions of my characters for anything. 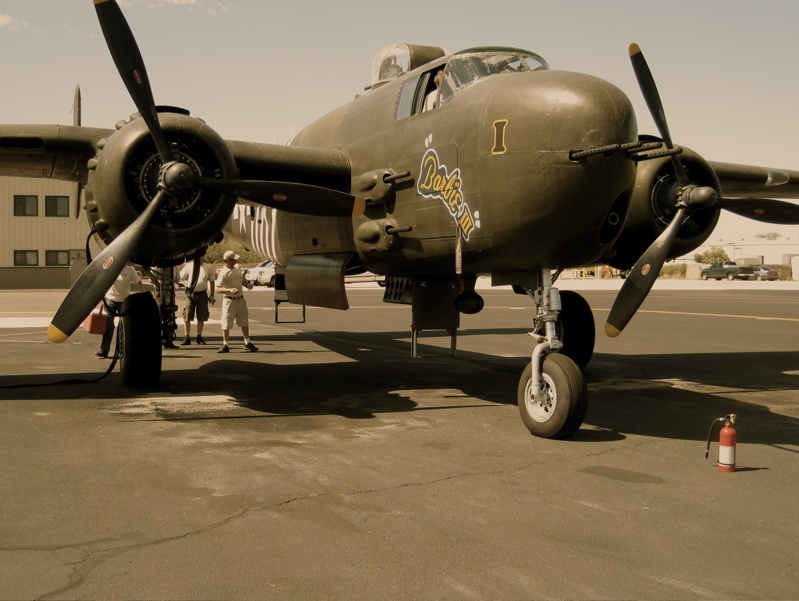 In fact, when I think of a B-25, I’m still a little queasy. But in truth, I’d totally go again. The tail guns. Nothing much besides a skin of metal, some canvas, and a pair of guns between you and an enemy attack. Stephanie Lile photo. I want to extend a special thanks to the great guys at Warbirds Unlimited—Ray, Leon, Bill, and pilot Jack Fedor for making this experience both smooth sailing and extremely enlightening (all four of us nominate Crew Chief Bill for Sainthood). And to my brave niece and nephews, many thanks for helping me “tap the gramps.” The book is all the richer for it. Join THE TAIL GUNNER crew! There’s just a few days left to help fund the production of the novel and save the WWII collection that inspired it. Click here to join the crew. March 25, 2014 —Today we’re shifting gears a touch to join the “Author Writing Process” blog tour. I’m honored to have been asked to jump into this pool of talented writers by Claire Gebben, author of the recently released historical fiction novel Last of the Blacksmiths. A fellow graduate of the NW Institute of Literary Arts, Claire settled in Seattle by way of Grand Rapids, Buffalo, and Cleveland, the city where much of her novel is set. Drawing from a set of letters discovered by a German relative, Claire researched and wrote the compelling story of a young 19th century blacksmith who immigrated to America. She even learned the blacksmith’s trade to bring authenticity to the words on the page. Claire’s writing has appeared in Shark Reef, The Speculative Edge, Soundings Review, The Fine Line, and Northwest Prime Time. The Last of the Blacksmiths is her first novel. You can read Claire’s responses to the Writing Process questions here. 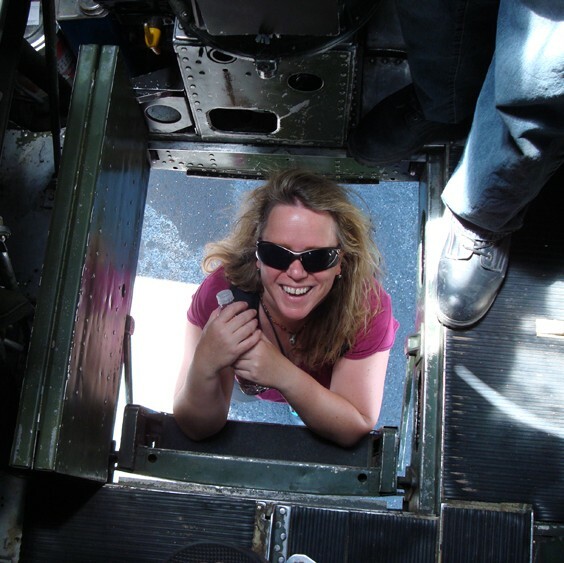 I am currently in the last five days of a 31-day blog blast and crowd-funding project for a novel near and dear to me called The Tail Gunner. It’s the story of a young girl who is cleaning out the hayloft of her grandparents’ horse barn and comes across a box of dusty, curled, mouse-chewed letters and pictures that were slated for the burn pile. When her grandmother tosses a picture of a young bomber boy into the fire and walks away, clearly upset, the bomber boy’s ghost steps out of the fire demanding that Sylvie help him complete his final mission. The story was born of the question, “What if spirits could transfer their memories to us? What would that look like?” It was also the product of my Dad’s WWII stash that my sister and I found while cleaning out the hayloft of our horse barn. It’s a remarkable collection that led me all the way from Washington State to a tiny beach on the island of Capri. I do have a sequel in the percolator, but that’s yet to be revealed. My other big project debuting this spring is an exhibit based on my short story “Ernest Oglby Punkweiler and the Fabulous-Miraculous Time Intrusionator.” The story first appeared in Soundings Review and has been adapted for use as the guiding storyline of a fun new exhibit of the same name. The project has given me the great delight of working with some of Washington State’s star children’s book illustrators (Mike Cressy, Richard Jesse Watson, Craig Orback, Jo Gerschman, Julie Paschkis, Karen Lee Schmidt, and Paul Owen Lewis) to create large-as-life scenes of key and quirky moments in the state’s history. An audio version of the story is also being recorded by the talented folks at Jack Straw Productions. 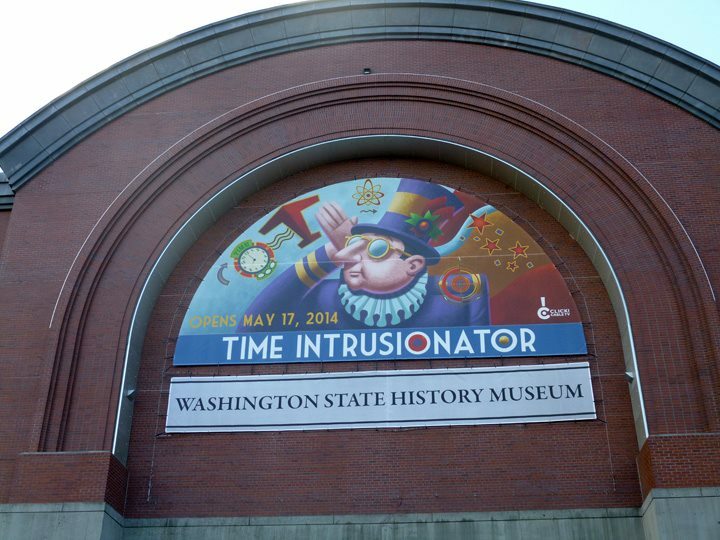 The exhibit opens at the Washington State History Museum on May 17, 2014. Everyone is invited. Collections—things. Everything I write is inspired by a thing or a collection of things. I like the challenge of finding the story in even the most “mundane” of things. Like Ernest Oglby Punkweiler, I’m an objectologist of the rarest sort. Perhaps it’s come from working in the museum field for nearly 20 years. Objects speak to me through the clues they carry and lead me on all sorts of adventures that come out in my writing. The Tail Gunner novel is based on the WWII collection my dad left behind. “Ernest” adventures are drawn from the collections of the Washington State Historical Society. A picture book manuscript I wrote was inspired by a collection of old railroad brochures. While what I write is both historical and fiction, because of its air of magical realism, it’s not hardline “historical fiction.” To me, that’s okay, because I know that the historical elements that are included in my stories are deeply researched and are pivotal to the story. Because I have to. While I write both fiction and nonfiction, underlying both is the deeper belief that objects have the ability to connect us to our past. Consequently, my stories tend to find me; there are sources of inspiration all over the place. In the early stages of a story’s development, I make a point to “find” the story not craft it. I let the objects, images, and ephemera lead me on a journey. Then I take those stories to the next level to create a framework and story arc, and then revise, revise, revise, through many drafts. It’s a lot of work, but it’s worth it, and it often yields both nonfiction and fiction elements that can be shared in a multitude of ways. I need a lot of variation in my work, so I write both short stories and long, fiction and nonfiction. Some people say a writer needs to focus on a particular genre, and indeed all of us writers usually find “our thing,” but trying a range of forms is like getting a well-rounded workout. There’s always that one thing that you most enjoy, for which you hold a natural aptitude, but you still have to stretch to get it all right. I have no idea. Well, that’s not entirely true. My stories usually begin with a line that starts sliding through my mind like those banner messages pulled behind small planes to advertise beer or launch a proposal. And that part comes after having done what I call a “feeding frenzy” of delving into as much research material as I can find and devour. But that part comes after mental images of scenes in a story have appeared in my mind. After I deal with that swirling cosmos of words and images, I put it all into a mental sack, depending on whether it’s a novel, a short story, a nonfiction article, or even an object label at the museum. Then, based on the type of word-product I’m after, I simply reach into the sack and pull out whatever I need. Longer works are harder for me because while I’m great at grabbing ideas and getting a story started, I often wind up in the woods with no idea where I’m headed. That’s when I go back and find the frame of the story. I identify key plot points and begin to outline the scenes that seem essential to the story. This makes it easier because then I can just write one scene at a time instead of getting overwhelmed by the enormity of the story. Of course, then I revise. The Tail Gunner novel took no less than 15 drafts, and a couple of those drafts were complete remodels. I’ve posted a few out-takes here in Mission 31 that were great color for the early drafts, but they got tossed out in later versions because they didn’t genuinely move the story forward. It’s tough to chuck a scene you love, but the truth is, it still informs the story even if it doesn’t get center stage. Writing is a puzzle for the mind; it’s fun, challenging, and can make you crazy. But then us writers would be crazy if we didn’t write, so we tackle the puzzles everyday and if we’re lucky, we manage to create works of great wonder and beauty. Next week, just in time for April Fools Day (but these folks are no fools) I’m delighted to pass the torch to two incredibly versatile and delightful story-makers. Gwen (Perkins) Whiting is the author of The Universal Mirror, a fantasy novel set in a land “where men have killed their gods.” Although she is a fantasy and science fiction writer by night, she’s an historian by day with her writing appearing in a range of publications from encyclopedias to Columbia Magazine, where her work recently earned her the John McClelland Award. A native of the Pacific Northwest, she blogs at Amazing Stories Magazine. Mike Cressy is outta this world. While toodling through the Internet looking at artist portfolios, I came across his work and discovered an image of the very character I had been writing about—Ernest Oglby Ounkweiler. Mike’s art quickly became central to the exhibit (come see it) and the rest, as they say, is his story (literally). Mike’s a guy with an eye for the unusual, one of his favorite books is the Power of Myth, and not only can the guy draw like nobody’s business, he can write in ways most people have never even imagined. You’ll find his blog at JetPack Studio.